Failure to resolve the Syrian crisis could lead to “total war” in the Middle East that would seriously affect Europe, French President Francois Hollande said, calling on EU countries to unite in their efforts to resolve the conflict in the war-torn country. In a joint speech before the European Parliament, delivered with German Chancellor Angela Merkel, Hollande urged European countries to join forces and cooperate with all parties concerned, including Russia and Iran, to find a political solution to the Syrian crisis. “What happens in Syria concerns Europe, what happens there will determine the balance of the whole region for a long time,” Francois Hollande told European lawmakers in Strasbourg, as quoted by AFP. “If we let the recent religious confrontations between Shiites and Sunnites get worse, then don’t think that we won’t be affected. It will be a total war, a war that will also affect our territories and we must act,” he added, as quoted by Reuters. He also urged all European countries “to make effort in order to make a political solution possible” and stressed the necessity for all parties concerned, including “Russia, Iran, the Gulf countries, the USA and Europe” to continue their efforts to resolve the Syrian conflict. “The whole Europe should join forces for [developing] a humanitarian, political and diplomatic plan,” the French president said, as quoted by RIA Novosti. At the same time, he once again emphasized that any political solution for Syria should be based on the removal of current Syrian President Bashar Assad from power, thus reiterating Paris’ the long-standing position on Syria. “We have to construct in Syria, with all those who can contribute, a political future which gives the Syrian people an alternative to Bashar or Daesh [Islamic State, formerly ISIS/ISIL],” Hollande said, as quoted by AFP. In her turn, Angela Merkel focused on the refugee crisis, defending Germany’s policy of maintaining open borders and advocating the distribution of refugees across Europe. “We have to recognize that, even if we tried to seal ourselves off completely – even at the price that people could suffer at our borders – that would help no one,” she said, as quoted by the Associated Press. The German chancellor once again called on European countries to work together to cope with the crisis and share the burden of taking in refugees. “In the refugee crisis, we must not succumb to the temptation of falling back into national action. Quite the contrary: now we need more Europe,” she said. 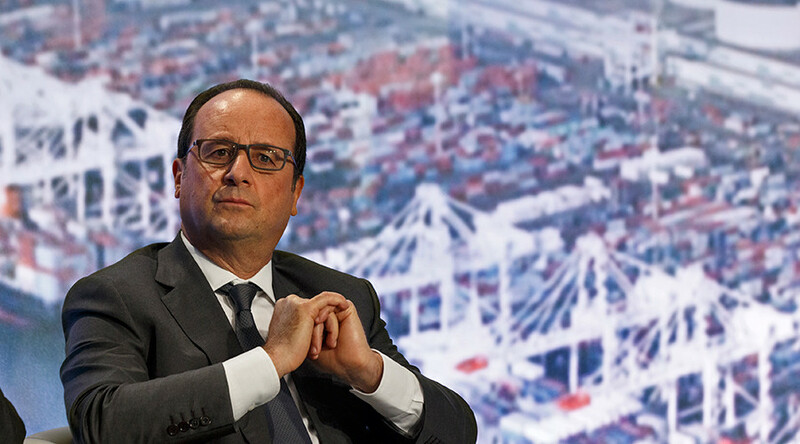 Hollande also commented on the necessity of developing and adopting a coherent common EU asylum policy. He said it would be “a tragic error” to bring Europe’s open borders policy into question. Hollande and Merkel delivered the first joint speech by French and German heads of state before the European Parliament since Francois Mitterrand and Helmut Kohl in 1989. Although the speech was positively received by many European lawmakers, it was also fiercely criticized by right-wing and euro-skeptical MPs, such as UKIP leader Nigel Farage and National Front leader Marine Le Pen, and also, partly, by the European Conservatives and Reformists Group (ECR) leaders. “80 percent [of those coming] are not Syrian refugees… in fact what you’ve done is open the door to young, male, economic migrants… [who] behave in an aggressive manner… the opposite of what you’d expect from a refugee,” he said. He also claimed that “more Europe” meant “more of the same failings,” expressing the hope that the forthcoming British European referendum would lead to the UK leaving the Union, thus marking “the beginning of the end” for the EU. He also said that the EU was playing a blame-game instead of looking for real solutions to the crisis. “Let’s work out what each country can do to help those fleeing for their lives. But telling countries what to do – forcing a plan on them – only risks more finger pointing… different countries can offer help in different ways. Let’s recognize this,” he said.